At Hilton Head Audioworks we realize that not everybody who might want to come to record here is necessarily a seasoned professional in the studio. So as a service to our clients we have prepared this tutorial on how recording sessions are typically conducted so that you understand the process before you arrive, making it that much easier to do good work in the most efficient way possible, saving you money in the long run. The tutorial will walk you through a typical recording session, one step at a time. We will talk you through each step and try and shed some light on why things are done in a particular way, or point out certain common pitfalls that have made themselves apparent to us over the years. Every once in a long while there are changes in an industry that are so profound that that industry is changed forever. The advent of digital multi-track recording on computer hard drives has done just that to the music recording industry with ProTools™, Digital Performer, and Apple’s Logic software leading this revolution. If you are technically inclined we have put a few Tech Notes links to a page pointing out how the hardware and signal flow are different from ‘the old days’. You don’t really need to know this stuff, but if you do, it will make for a better understanding of what’s easy and what’s not, giving you better efficiency in your project. The switch from “linear-access” recording (tape-based) to random access (computer hard disks) is so far reaching that it goes beyond being “more flexible” or “more convenient”; it truly fundamentally changes the way you can approach your work! It used to be that there were very specific and well defined procedures and ways of doing things that were defined by the limitations of tape based recording–well those restrictions are all gone now! You can truly do just about anything. Sometimes it feels to us like ‘everything you know is wrong’ when you realize that a significant portion of the ‘rules’ you’ve been adhering to for 20 years just don’t apply anymore. We have elected to use MOTU's Digital Performer and Apple LogicDigital Audio Workstation software as our main recording platforms in addition to the curiously ubiquitous ProTools™. It is a comprehensive recording environment for both Audio and MIDI with seamless integration of both data types in one program. The depth and capability of this software is truly mind-boggling in terms of the power you have over the presentation of your music. There are three seemingly minor differences between computer recording and tape recording that at first seem trivial but actually are so powerful they fundamentally change the way you can record and produce music! The first is: when you press record, you don’t actually erase anything that might happen to be present on the track at that spot. For us, this one fact is so powerful that once we fully understood all that it meant… well let’s just say we haven’t started a project on analog or digital tape in 15 years! The second big thing is: the UNDO button! In fact there is unlimited UNDOs!!! Don’t like that take? UNDO. No wasted tape. That complicated 15 step edit you just did that doesn’t sound right after all? Undo 15 times and you’re back, no harm done. Tech Note #1 for the hardware differences there. This all said, let’s dive in and see how a typical band session unfolds in this brave new world of random access recording. Once everything is loaded into the studio and set up we begin the "Sound Check". The purpose of Sound Check is twofold: to make sure everything is plugged in correctly and sounding good and also to obtain good recording levels on each instrument before pressing record for the first time. Drums are usually checked first since they are the most complicated. The engineer will start with the bass drum and get the preliminary sound on that and each of the other drums and cymbals one at a time and then all together as a kit. If you have a special way you want the drums to sound, tell the engineer as he goes through each of the drums and cymbals. If the sound you describe can be found only with lots of special effects gear it will be better to just get the basic drum sound for the present because a lot of extra effects in the headphones can make it harder to hear yourself while laying down the basic tracks. You can always add the effects later when mixing down. After checking drums, we'll check the bass and guitars, keyboards, vocals and whatever else needs to be recorded during basic tracks. During sound check you can also begin getting basic levels adjusted on your own individual headphone mixer. When everything is up and running and sounding good we start doing the "Basic Tracks". This is where the basic rhythm framework of the song is recorded. You should know in advance the exact arrangement of the song and how fast it will go, and know it well enough to be able to start playing from places in the middle of the arrangement in case that becomes necessary. As you can see you have all the tracks named (organized by color if you like), input/output paths are visible as are the play enable buttons (blue arrows) and of course, a little graphic display of the data (music) on that track. All this looks fairly familiar and just like how you’d expect it to look. But this is where the similarity ends. Basic tracks are also called "rhythm tracks" because you are trying to set up a solid rhythmic foundation for the rest of the song to be built upon. Usually you will have someone sing what is called a "scratch vocal" as the basic tracks are being recorded. This is a vocal that is not intended to be a final vocal; it is just used as a reference so you can tell where you are in the song while playing and to let everyone know where the vocal will be singing in the arrangement so as players add extra parts and fills they don't stomp on the vocal. If you are comfortable playing with metronomes, it can sometimes be beneficial (although not absolutely necessary) to work with a "click track" which is recorded onto it's own track and then played along with, to insure that the song does not speed up or slow down, or at least does so in a controlled manner. Working with a click track can be difficult sometimes so you should practice with a metronome ahead of time to feel comfortable and make sure the tempo you choose is a good one. To read more about click tracks, read Bill's complete tutorial. Once the basic rhythm tracks are down on tape you will have to do "Overdubbing". Overdubbing is when you listen back to the instruments of the song you have recorded thus far and add your next part (vocal, guitar solo, horns, whatever) alongside the others, building up a complete performance. Overdub tracks can be recorded in groups or individually. Of course there are a million variations on this scenario but you get the general idea. Editing musical performances is where computer based recording truly distances itself from any linear access (tape) system. The types of edits and fixes you can do in these systems is nothing short of amazing. This is the primary editing window in Digital Performer officially known as the Sequence Editor. The basic premise here in the edit window is very simple: select some music (a little or a lot) and perform some kind of operation on your selection. Copy and Paste whole choruses/phrases/words/individual notes to other places in the song. Correct momentary pitch problems or transpose notes from one pitch to a completely new pitch. Edit out parts of the song you don’t want like too long intros, a solo that rambles, or a 16 bar vamp between chorus and verse that should be 4 bars. Apply Plug-ins to specific notes or phrases. What’s a “Plug-in” you say? Well to understand that you have to look at the third main screen, the Mixer! After the overdubs are completed you will need to "mix down" your tracks to stereo or whatever your final output configuration will be (surround, mono, whatever). This is your final master and will be where you want to get everything sounding exactly right. Before you can get to the real nuts and bolts of mixing you need to do some organizational and setup things like choosing some reverbs or compressors and installing them in obvious places, and clean up your tracks so they only are showing waveform displays while they actually are playing. A perfect example of this is tom tom tracks. The amount of time tom toms actually get played during a song is relatively small so for the rest of the time the tom mics are just sitting there picking of the other drums and cymbals along with the sympathetic ringing of the toms themselves. So we delete those tracks except when they’re actually being played. The same is done for all the rest of the guitar tracks (gets rid of amp hiss and little string noises prior to entrances), vocals (gets rid of headphone bleed, clothing noises, throat clearings and lip smacks and otherwise intrusive saliva). This is what the mixer looks like in Digital Performer. It has all the standard features you’d expect in a hardware mixer; automated faders, pan pots, auxiliary sends to effects, insert points, master channel etc. It functions pretty much as you expect it would, except that since it is just software you don’t have to be at the mercy of how much hardware you have (or don’t have) lying around. A more thorough explanation of how a software mixer and plug-ins work is on Tech Note #2. 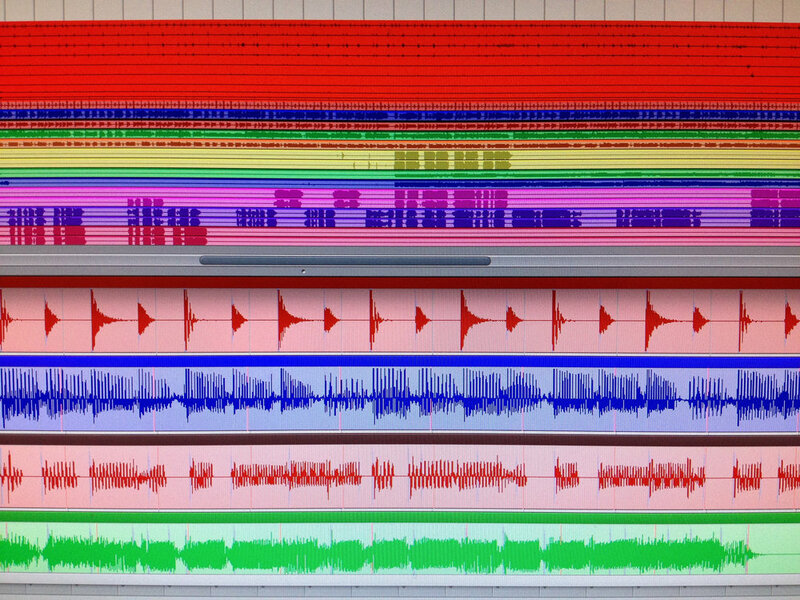 Once you have done all your track cleaning, you can begin the actual mixdown. Mixing essentially has three stages. First, you listen to each recorded track by itself and adjust the sound so that the instrument (or whatever) sounds the way you want. This usually involves adjusting the treble/midrange/bass and doing some kind of dynamics control (compression/lmiting) and making a preliminary estimate as to how loud you might want that element in the mix. Next, effects are added. Effects are things like reverbs, delays, flangers, phasers, pitch shifting, and all the other wonderful "toys" that modern technology has provided for us. There are some truly bizarre and wonderful plug ins to try when you’re looking for that something extra but aren’t really sure what… Volume balances between tracks and instruments are constantly being tweaked to achieve the best overall mix balance throughout the song. The third part of mixdown is the actual final balancing of all the tracks together to get the best blend during each moment of the song. We've all heard the expression that you can "Fix it in the Mix!!!". To some extent this is true, but only certain types of things can be fixed in the mix. Mixing can fix things like uneven level changes within tracks or removing unwanted parts, adjusting entrance times etc. Mixing cannot fix things like truly sloppy playing or mumbly singing in vocals although in the computer age, we have a lot more tricks up our collective sleeves than we used to. A large range of things that used to be impossible are now possible: Single note instruments and vocals can now be tuned up on the fly, individual notes can be time-stretched or squeezed without changing the pitch to match others in a vertical stack, individual phrases or notes can be lifted from elsewhere in the recording and moved to new locations in the song. So once your mix is designed you keep playing the song over and over, adjusting volume levels of the tracks until you arrive at a point where everything sounds good and is balanced for the whole song with a few exceptional places in some tracks. At this point the mixer automation is turned on and these “base levels” are set for all tracks for the whole song. You then start your mix from the beginning and when you run across one of those exceptions (like a vocal line that gets lost when the singer goes into a low register, or a guitar note or chord that sticks out) you use the mixer automation to raise or lower the level to fix the problem. Continue doing this until you reach the end of the song. Start the song over and listen again, perhaps you will catch something else to be fixed. Continue this procedure until you can honestly say that everything sounds good and you can’t think of anything you would like to change. Congratulations, if it all sounds good and you don’t want to change anything, you must be done! You then run off this mix to a master stereo file which is your highest quality version of that particular song. By far, one of the greatest advantages of the computer-based studio is the ability to recall a complete mix environment with the click of a mouse! Because all compression, reverb and FX, volume controls take place in the computer instead of an array of outboard compressors, delays, and reverbs it can all be recalled instantly ready to make a small change. In the historical “days of tape” you might spend as much as an hour resetting the console, patching in all the rack gear, duplicating all your old settings on each piece of gear, running the mix to be sure you haven’t overlooked something, until you’d be ready to update your mix. It was simply too time consuming (expensive) to be worth it for small changes, forcing you to be stuck with some small thing you didn’t like on your final product. But no more! These days the mix that’s on the CD is almost never the first mix done. We have done as many as 5 or 6 mixes on some songs, with some of those updates being for single note fixes and adjustments. It only takes about 5 minutes to call up a mix, make some small tweak and roll off a new mix. After mixing you will need to put all the songs in the correct order and decide how much space should go in between them. This is called "pacing" the album. Sometimes songs will benefit from an internal edit in order to reach a particular target length or shorten an intro. You can even combine portions of different mixes and takes to create a composite master performance. You can also change the relative loudnesses of the songs individually, or tweak the tonal balance (EQ) so each cut flows smoothly into the next. All of these things are part of the process known as "mastering" and at Hilton Head Audioworks is done with Ozone 7 Advanced Mastering software and all of our 3rd party plugins. So there you have it. A computer based recording studio can be an extremely flexible, creative tool for the person who knows how to use it effectively. It takes a lot of thought and time to become an expert at using a modern studio but anyone can get good results the first time out by following the advice and hints presented here.